HALIFAX -- A Halifax-area woman says she struggled to save the life of her pet Pomeranian when a much larger dog bounded through the front door of her home, grabbed the tiny dog in its jaws and wouldn't let go. Rachelle Coward said her partner had just let little Diamond outside and was holding the door open on Monday morning when the big dog appeared and chased Diamond inside. "Next thing I know, I turned around and there was a big pit bull and he bit her and attacked her at the neck," Coward said in an interview Tuesday. "From then on, he just had a locked jaw and would not let got. I was on top of him trying to do everything I could to get him to let go of Diamond." Coward said she, her partner and mother wrestled with the large, grey and white dog, believed by officials to be an American Staffordshire terrier. It appears Diamond died during the struggle and the other dog ran off with her body still locked in its teeth, Coward said. The 25-year-old university student said the terrier dropped Diamond's body in a nearby driveway when her mother swung at it with a ladle. "It was trying to attack me," Coward said, recalling the moment she picked up her dog's remains. Police were called and the terrier was tracked down and taken to a local shelter. A spokesman for Halifax's regional government said the owner of the terrier could be facing two bylaw infractions that cover animals running at large and attacking. Brendan Elliott said each infraction carries a maximum penalty of $200. As well, he said the region has the option of seeking a court order to seize the dog and have it destroyed. However, he said no decisions will be made until an investigation by animal control officers is completed. 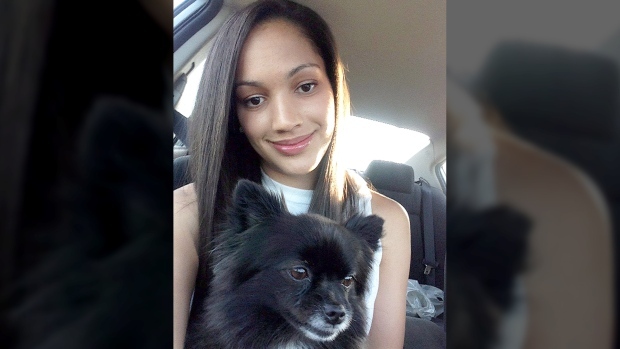 Coward said her four-year-old, black-and-white Pomeranian will be missed. "It's going to be a hard Christmas," she said, "She was definitely loved, spoiled and part of the family." She said she believes the terrier should be put down. "I know it's hard because it's someone else's pet, but I'm also scared to walk in my own neighbourhood."